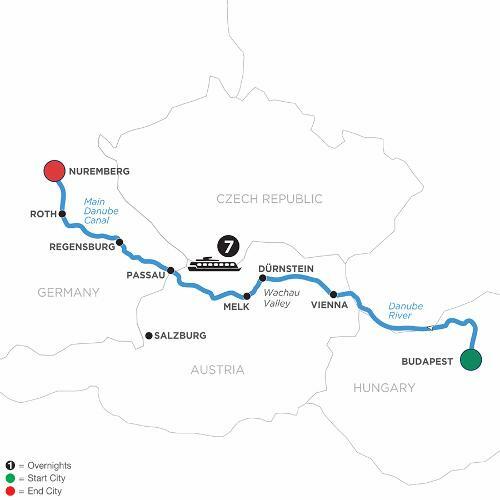 Sail along the Danube River with exciting stops and panoramic views in Austria and Germany. At this time of year, the towns and cities are festively lit and decorated, each in its own particular style and taste. Christmas markets abound, and the strains of carols and aroma of gingerbread fill the air. Embark your ship in Budapest, and sail up the Danube River to Vienna, Austria. Here, Christmas markets are scattered around the city, with the biggest located in front of the city hall. Join a traditional city sightseeing or a guided culinary walk through the Christmas market to taste some of the local traditional specialties. Glide through the winter wonderland of the Wachau Valley, and in Melk visit Austria’s majestic Benedictine Abbey. You’ll love a guided walk through Passau, with its narrow streets and beautiful patrician houses, and the Christkindlmarkt set against the stunning backdrop of St. Stephen’s Cathedral. Sail further up the Danube River, and you’ll come to the medieval walls of Regensburg, the only German city not bombed during WWII. Your last stop along the Danube River is thousand-year-old Nuremberg, famous for one of the oldest Christ-mas market in Germany. After guided city sightseeing, be sure to explore the many stalls and try some spicy gingerbread and Glühwein! The perfect ending to a memorable river cruise vacation!